Beachfront condo #401 is a 2 bed/2 bath corner unit on the 4th floor of the 1st building, at the north edge of the property right in front of the pool. Extra windows provide even more expansive ocean views and also let in lots of light. Pick up some fresh local food to prep in the full kitchen, then finish it off at the property’s gas grills & talk story with other guests, as the locals say, and get/give tips on where else to go on island! Having meals on your private lanai while being mesmerized by the goings-on out in the blue, blue Pacific is an experience you will never forget. Bedrooms have en-suite bathrooms. The master has a king bed & a large window that gives you more of that in-your-face-ocean view you’ll never tire of, while the second bedroom has twin beds and the living area has a sleeper sofa. Two flat screen TVs with complimentary cable, WiFi & local phone; central AC, ceiling fans, and an in-unit washer/dryer that's super convenient. This condo is exactly as described and shown in the photos. We loved having a view from the living room and bedroom. Being on the 4th floor we felt comfortable leaving the window in the bedroom open at night so that we could hear the ocean and feel the breeze. The condo was clean and partially remodeled. I'd give it 5 stars once the kitchen and bathroom get remodeled. The condo was well stocked with toiletries and beach towels and beach chairs. Exceptional location. Loved having the ABC store and Shave Ice across the street. Quiet beach. We would stay here again in a heart beat. Fabulous Condo! Great location and views on a beautiful beach. Awesome location and gorgeous view! Loved that it is a corner unit so there is no neighbor on one side. The digital signal for the tv in the family room had to be reset each morning, which was a bummer but tolerable. The unit provided starter quantities of all the essentials in addition to beach chairs and beach towels. We would definitely stay here again! Mahalo for staying with us! We're happy you had everything you needed for a great trip! Aloha. I stayed at this condo with my mother and a baby. We found the location to be excellent, close to all of the sites we wanted to see, restaurants and shopping, and best of all: right on the beach! Mahalo for staying with us! We're happy your family enjoyed it! Aloha. Nice Ocean Front Condo Centrally Located. 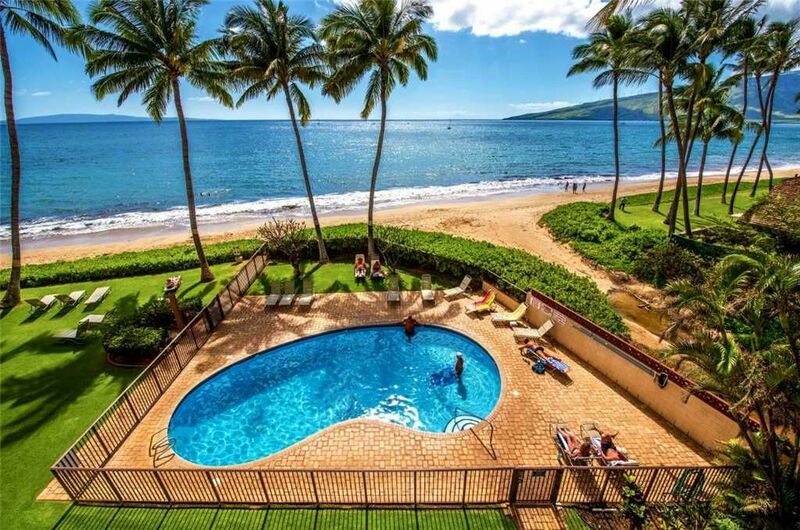 This was our second stay at the Kihei Beach Resort property. Quiet ocean front property with easy access to Sugar Beach for water activities, walking or running on the beach and watching Maui sunsets. The pool is also Ocean front. Easy access to highway to visit other areas of the island. Condo was nicely furnished. All condos are Ocean Front. Plan to stay here again on our next visit. Thank you for your review! We are happy to hear you enjoyed your time here and we look forward to having you stay with us again! Aloha. We enjoyed having you! Come see us again. Aloha.